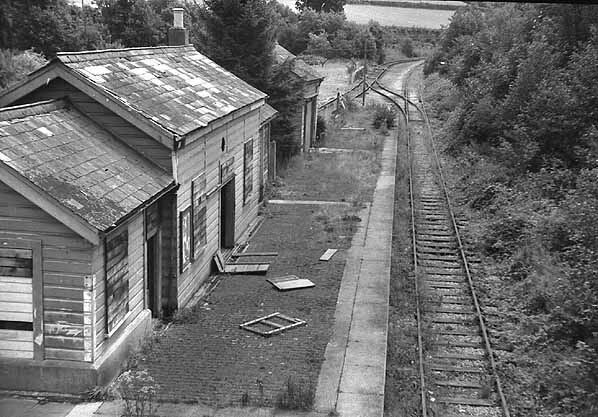 Nowadays it is difficult to imagine that Chudleigh once boasted its own railway station, yet up until construction began on the town bypass in early 1970 the platform and buildings were still there for all too see, even though they had by then, fallen into disuse and become rather dilapidated. They were situated alongside the banks of the River Teign and immediately to the south of the old A38 road over bridge (downgraded to B3344 on the opening of the A38 bypass in June 1973), but the site – together with about two miles of the original track bed – then 'disappeared' below the tarmac of the new dual carriageway and the station became consigned to the history books. In the early 1860s when the various Acts were being put through Parliament a matter arose that became referred to as the 'Chudleigh Deviation'. The first route considered at Chudleigh in 1863 was to cross the turnpike road on the level roughly adjacent to Chudleigh Bridge. Parliament did not agree and so various deviations to the route were considered both to the north and south of the turnpike road. These deviations caused problems as Robert Pulsford of Pitt House had previously been promised that the line would not encroach on his fields and on the other side of the river, at Rocklands, the Rev. Frederick Ensor was not in agreement to losing part of his land that lay adjacent to Pottery Lane. Nothing further was done until 1868 when a route was put forward that would satisfy both Pulsford and Ensor. The route this time allowed for an overbridge, raising the approaches by 17ft. Parliament were not happy with this, nor was Rev. Ensor who commented that his privacy would be compromised. Eventually in 1872 Parliament agreed to an overbridge on the stipulation that the approaches must not be raised more than 7ft. With this in mind the route was again revised to the satisfaction of both Pulsford and Ensor and the work was able to progress, some nine years after the first plans were put forward. The only negative in the final outcome was that for the trains to pass under the bridge, with the necessary clearances, the track had to be lowered thus taking its level to below the floodplain. A situation that became evident almost every winter when the station became flooded. Work on the Chudleigh main station building, platform and the laying of rails had started in 1877, with the turnpike road (later designated A38, now B3344) over bridge the following year. The loading bank was completed in 1879 and the pedestrian stepped access from the main road, down the side of the embankment, to the north end of the platform was completed in 1881 as was the goods store adjacent to the main building. The sidings were completed early in 1882 as was the signal box. 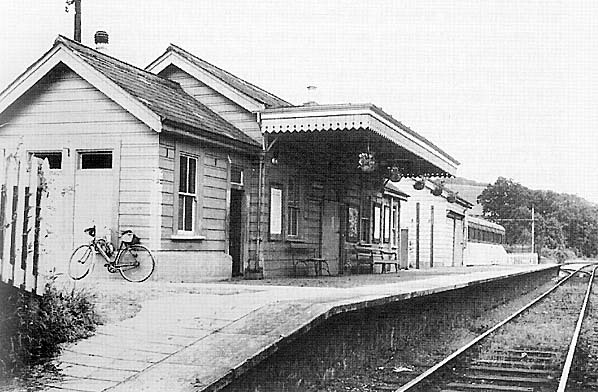 The station itself was brought into use on the 9th October 1882 when it became the first intermediate stopping point on the then newly opened branch line that ran from Heathfield (on the Newton Abbot to Moretonhampstead branch) to a station at Ashton, a total distance of some six and a quarter miles, Chudleigh being two miles from Heathfield. The line then continued as a remote siding for a further one and a quarter miles to Teign House, later to become the site of Christow station. Built to the standard gauge of 4ft eight-and-a-half inches by the Teign Valley Railway Company, the line had taken almost nineteen years to complete due to recurring financial crises causing lengthy periods of inactivity during the construction work. Perhaps even more surprisingly it had also taken no less than nine acts of Parliament to reach fruition. 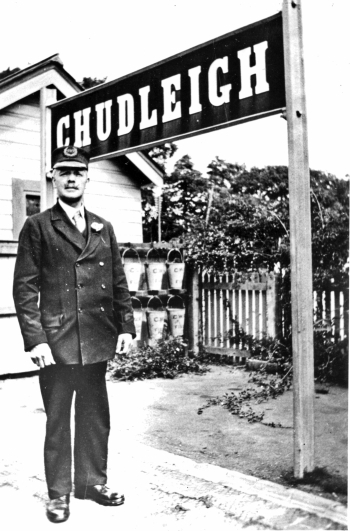 The townsfolk of Chudleigh were more than ready to be joined to the rail network and in the first week almost one thousand tickets were sold at the station. Ticket sales increased year on year until the peak in 1913 when 19,895 were sold. From 1919 the decline began, no doubt affected by the new Devon General motorbus service that linked Exeter and Newton Abbot via Chudleigh. Originally, apart from Chudleigh, there were only two stations along the line – Trusham and Ashton – which were served by five trains daily (Monday–Saturday) in each direction. On 1st July 1903 the Exeter Railway Company finally completed its long-proposed line from City Basin Junction (in St. Thomas, Exeter) to Christow via Ide and Longdown to connect with the earlier railway terminus at Teign House, the complete route a distance of seventeen miles. For the next twenty-one years six trains operated daily in each direction. From 1924 to 1939 there were seven trains daily in each direction, reducing to four in the war period. 1946 saw services increase to five trains daily (not Sunday) plus extra trains on certain days, a situation that remained until cessation of passenger services on 7 June 1958. 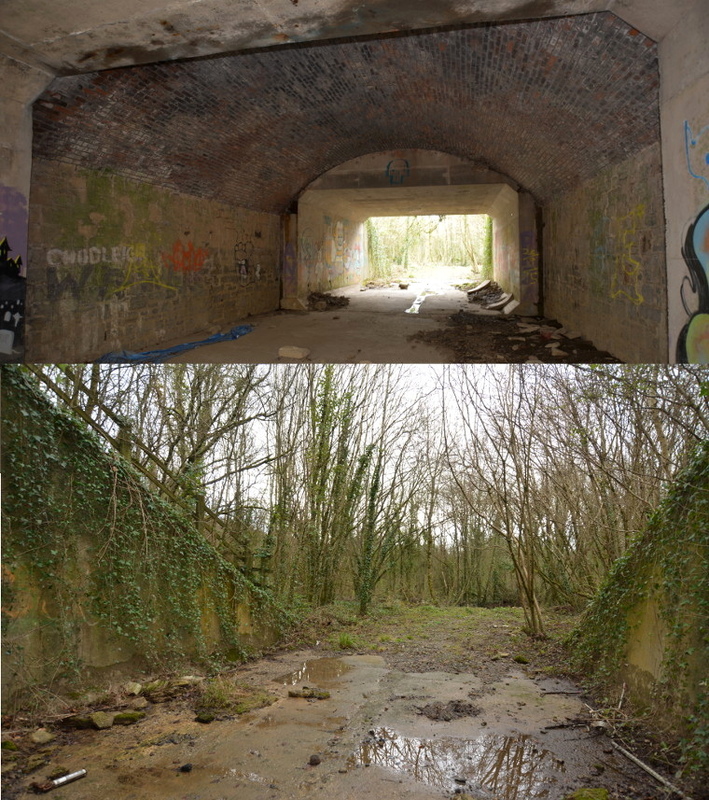 Throughout its length the line consisted of approximately twenty-five bridges, thirty culverts and two tunnels, one each side of Longdown station. In 1928 the first telephone circuit was installed between Heathfield and Exeter replacing the former single-needle telegraph system. Although generally known as either the Teign Valley Branch or Teign Valley Line it was in fact operated by two distinct companies, Teign Valley Railway Company and Exeter Railway Company until 1 July 1923 when they were both absorbed into the Great Western Railway. Nationalisation came in 1948 when the name British Railways was born. The existing stations were later supplemented by the opening of three unstaffed halts – Chudleigh Knighton (9th June 1924), Dunsford (16th January 1928) and Alphington (2nd April 1928) – which in common with many other such halts being provided by the Great Western Railway Company at around that time, was done in a bid to stem increasing road competition. Nevertheless, even before the provision of these three new halts, passenger traffic on the line had always been rather modest, one reason being that the majority of stations and the newer halts were situated some considerable distance away from the towns and villages they served. Instead it was the goods traffic that stemmed from the numerous mines and quarries in the Teign Valley that proved to be the line's life blood for many years, especially when the transportation of roadstone took off in a big way in the early 1900s. Apart from catering for the regular passenger and goods trains, the line was also used as a diversionary route when problems arose on the main coastal line between Exeter and Newton Abbot. This sometimes led to the unfamiliar sight of express trains, including the Cornish Riviera being spotted travelling slowly up or down the Teign Valley at various times from 1921 onwards. Even so, this could not disguise the fact that as the years progressed fewer and fewer people were using the branch trains due to the combination of improved bus services being introduced to the locality and later, increased car ownership. Consequently when it was announced in January 1958 that the passenger service was to be withdrawn on 3rd March, it came as no great surprise. There were some representations made against the closure which led to a slight reprieve until 9th June. In all 571 tickets were sold at Chudleigh in that final six month period, compared to 9,948 sold in the same half-year of 1913. Because there had never been a Sunday service on the line, the last day of passenger services was Saturday 7th June, on that day trains were strengthened by extra coaches to cope with the heaviest demand seen for some time. The final train was the 9:30pm from Exeter St. Davids but after arriving late back from Newton Abbot it did not commence its journey until 9:54pm. This, combined with further delays on the way, meant that it finally arrived at Newton Abbot an hour late at 11:35pm. Coincidental with the withdrawal of the passenger service, the section of the line from Alphington to Christow was closed completely and the Chudleigh station building was boarded up and had its canopy removed. Between Heathfield and Christow, however the line was retained for goods traffic, which by then was catered for by just one train running on Tuesdays, Thursdays and Saturdays owing to the fact that most of the quarries producing roadstone had been exhausted, many even before the outbreak of the Second World War. About the only exception was Crockham Quarry at Trusham, where the amount of stone being extracted was still considerable, by then though the much of this was being transported away by road. Finally by November of 1967 the sidings at Crockham had fallen into such a bad state of repair that the permanent way supervisor at Newton Abbot declared that they could no longer be used. Earlier, the winter of 1960 and the March of 1961 severe flooding of the Teign washed away the track bed just beyond Trusham which was never reinstated, thus isolating Ashton and Christow completely. These stations were officially closed as of 1 May 1961 and the tracks lifted in the summer of 1963. Within a few more years the majority of goods trains did not progress beyond Chudleigh, where the traffic mainly consisted of coal and gas oil tanks, the latter serving the gasworks in Oldway. Records of goods traffic at Chudleigh survive for some years. As with passenger travel the most lucrative year for the station was 1913 with 11,488 tons handled (95% being inward traffic) but by 1943 tonnage was almost halved to 6,120. To make matters worse Devon County Council (acting on behalf of the then Ministry of Transport) were, in the late 1960s, busy making plans for the construction of the Chudleigh bypass, which included using a two mile section of the track and station site, which was suggested to save an estimated £100,000. The outcome was that British Railways eventually capitulated and, following the cessation of coal traffic at Chudleigh on 4th December 1967 went on to close the section of the line from Heathfield on 1st July 1968 – the final chapter in the life of one of the most picturesque branch lines in Devon. The Chudleigh bypass was opened on 21 June 1973, comprising a distance of 4.44 miles, the total cost being £3.9 million. 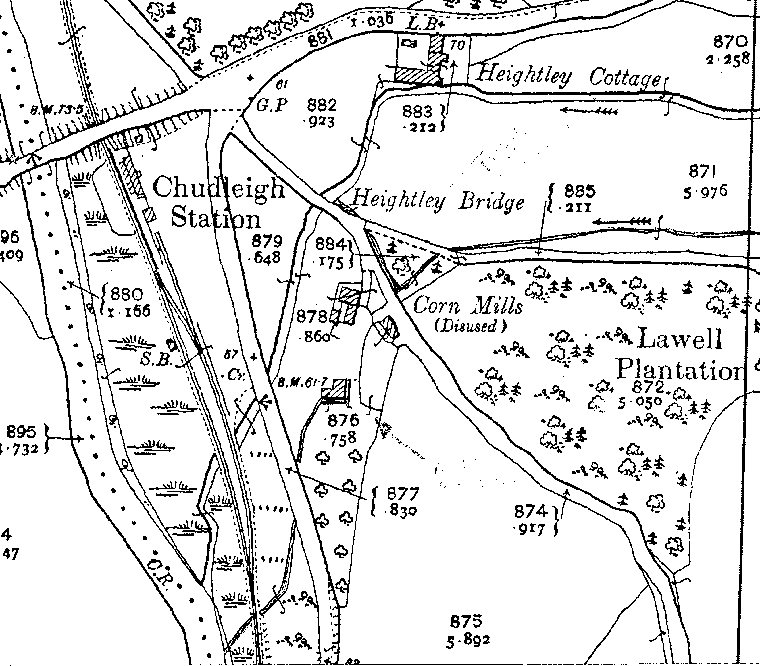 The only openly visible reminder today of the one-time existence of the station is that the junction signage of the B3344/A38 states the road junction name as 'Chudleigh Station' and the section of the B3344 from the end of Parade at Coburg down to Chudleigh Bridge is still known as 'Station Hill'. Also, now hidden beneath the widened B3344, the original brick-built bridge arch over the old track still exists between the southern sliproad to the A38 and Chudleigh Bridge, showing – contrary to popular local belief – that the whole track and station site were not completely buried under the A38; while the sliproad buried the station forecourt, the location of the platform and a short section of old trackbed is till open ground. 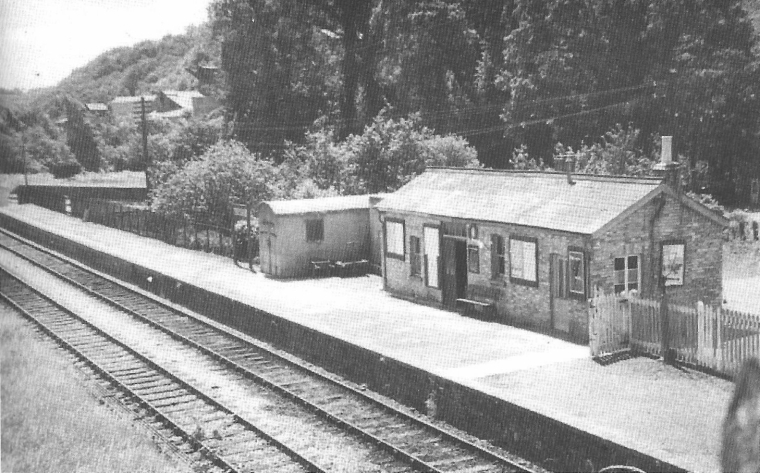 The railway station at Chudleigh was set in an idyllic spot on the banks of the River Teign one mile to the south of the town and was approached by road via its large forecourt alongside the B3193 leading to Kingsteignton. In those days the B3193 ran parallel to the railway line as far as Bellamarsh only separated from the line by a low wooden fence. Passengers arriving at the station could also use pedestrian access which was afforded by a flight of steps built up against the south-eastern side of the embankment of the adjacent road overbridge. In 1919 Devon General started their Exeter to Newton Abbot bus service via Chudleigh (Route No.1) and this meant that for most of the local inhabitants still dependant on public transport they tended to travel to such places as Newton Abbot and Exeter by bus thereby avoiding a fairly long walk at either end of their journeys. Due to this and the rather infrequent train services operating on the Teign Valley Line, ticket sales were to see a major downturn which never really recovered. Like those on many other country branch lines in the West Country, the actual station was a fairly simple affair and consisted of a 160ft long platform, faced with granite, on the eastern side of the single track. The covering was mainly of brick, edged with concrete slabs with rounded shoulders on the line side, and it was backed throughout most of its length by a neat, white painted wooden fence of 4ft high slats, their tops cut to an apex. At the northern end, and set back only a relatively short distance from the road overbridge was the main station building, modelled directly on the station building at Heathfield, complete with canopy and an adjoining wing on either side, with a single chimney protruding from its roof. It was constructed of horizontal timber planking, covered with sand and buff paint, under a conventional pitched roof of grey slate with plain up ridge tiles (as were the two wings, which served as the gents toilet and a store/parcel room respectively, the wing nearest to the over bridge having a chimney). It had a sliding door giving access to the platform and a rear door with porch facing the forecourt. In the early years the firm Wyman & Sons Ltd, booksellers and news agent operated a small sales facility within the building. Apart from the main station building, the only other structure on the platform was the goods lock-up. Again of wooden construction it lay just beyond the main building, the two separated by a GWR type station name board. Devoid of any chimney or windows, it was equipped with a sliding door on the platform side and another at the rear in order to facilitate the transfer of goods to and from road vehicles arriving in the spacious station yard and forecourt. Immediately beyond the foot of the platform, at its southern end, was the commencement of the goods loop. Equipped with a 100ft long loading dock and a loading gauge, this lay on the eastern side of the running line and had a short spur which ran directly behind the platform terminating just short of the side wall of the goods lock-up, where there were stop blocks. In 1914/15 the parish council approached GWR with a view to extending the siding due to increased road stone traffic and although the GWR were enthusiastic the Teign Valley Railway Board did not however support the idea and so nothing was done. The siding usually contained a couple of coal wagons for Taverners, the main Chudleigh coal merchants for many years; in the years 1939, 1956, 1957 and 1958, a camping coach was parked, in common with a number of other rural stations in the West Country. 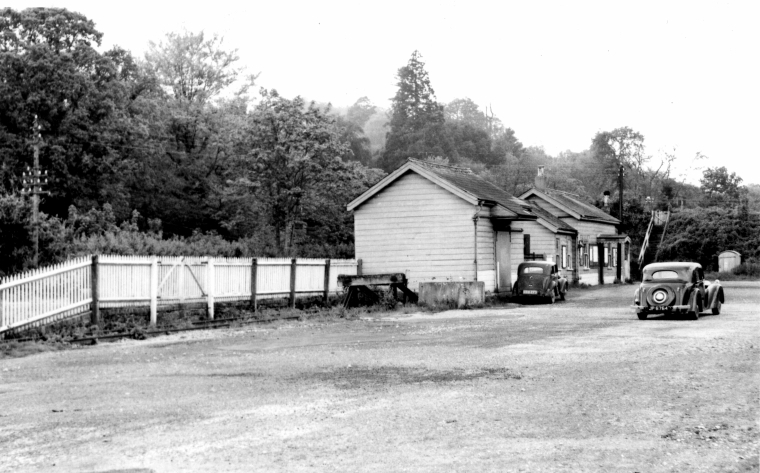 Chudleigh station in 1958, with the camping coach visible in the siding at the end of the platform. From the line opening in 1882 Chudleigh Station also boasted its own timber clad signal box (situated opposite the goods loop, on the western side of the running line) with a thirteen lever frame, and had been fully signalled. However, the advent of the electric staff system of signalling in 1903 led to its closure in 1910 and being replaced by two simple two lever ground frames to control the connections of the goods loop to the running line at each end. In about 1940 the upper part and its hipped roof were removed and the remaining part roofed over and brought into use as a Permanent Way mess hut. In GWR days it was commonplace that the station surroundings were kept in good order, particularly those areas used by the passengers. Often the area immediately opposite the platform would be turned into a formal garden. Indeed, this practice was encouraged by GWR who awarded prizes annually for the best kept station gardens. It is not known whether Chudleigh was ever successful but from photographs taken in the 1930s it can be seen that there was such an attractive ornamental garden opposite the platform in the form of a large semi-circle bordered by a low hedge. The competitions continued after World War II but at Chudleigh it seems that nothing more was done with the garden after the stationmaster post was finally abolished in 1938. 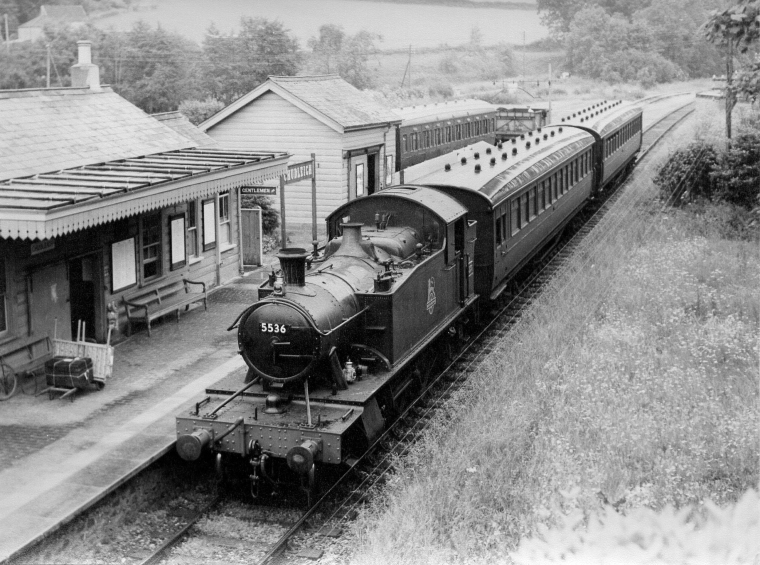 Chudleigh was the only station on the Teign Valley Branch to operate a parcel collection and delivery service with the town. The original agent appointed by GWR was Mr William Tremeer whose premises in Fore Street were located in the building that now forms the Bishop Lacy restaurant extension. On his death in 1899 his son Ernest took over, whose mule and cart was a familiar sight in the town. On his death in 1925 his wife was appointed agent although in practice it was her daughter Ruth that continued to run the service for a number of years. From the Tremeer family the agency passed to the Pike's who by then operated a garage from 77 Fore Street. Bernard Pike modernised the service by introducing a lorry for the deliveries. 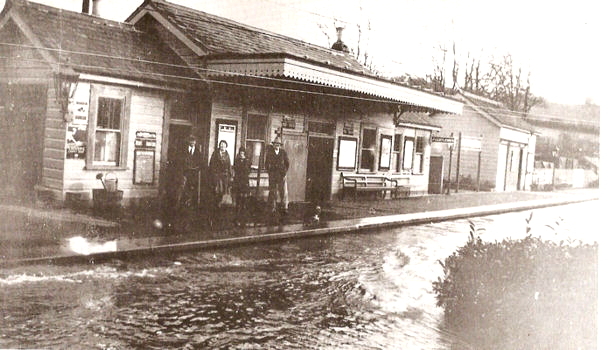 Flooding of the line at the station was almost an annual occurrence being as it ran alongside the River Teign. The main problem was in the planning of how the turnpike road (later designated A38) should cross the line. During the long and protracted planning stages a level-crossing was suggested but this was overruled in favour of an overbridge. However a constraint was that the level of the road embankment was to be raised no more than 7ft from its existing level. This meant for suitable clearance the trackbed had to be lowered which took the line to a level below the flood plain. The extent of the flooding was usually 150yds toward Heathfield (from the overbridge) and 80yds toward Trusham. As flooding made the line impassable, a timber built flood platform was installed in 1920 on higher ground approximately 100yds toward Trusham on the east side of the line which had a raised gangway access from Pottery Lane (now Oldway). In consequence trains from Exeter would terminate at that point with passengers being transferred onward to Heathfield by bus, the GWR having an ongoing arrangement with the Devon General Omnibus Company. It was the responsibility of the stationmaster and in later years, the porter-in-charge to contact the Engineering Department, the persons in charge at Heathfield and Trusham and the Exeter stationmaster as soon as flooding was observed. On the Trusham side of the overbridge, close to the timber built flood platform and adjacent to Pottery Lane was the station allotment which was mainly used for growing vegetables although shrubs and flowers are known to have been grown too. Again looked after by the station staff it was always kept in good order as it was easily visible to those passing by on the trains. The station was opened on 9 October 1882 and its first stationmaster was James Box. A Cornishman born in 1852, he had joined The South Devon Railway in 1872 and was initially placed at Torquay where he was based for the next ten years. On promotion to stationmaster he was transferred to Chudleigh. He served for the next twenty years until leaving in the autumn of 1903. On leaving Chudleigh he was presented with a timepiece and a wallet of notes by Lord Clifford. On 21 September that year he took up the stationmaster position at Ashburton where he remained for the next seventeen years until his retirement in the July of 1920. At that point he was aged 68 and had served a total of forty-nine years for GWR. No stationmaster house was ever provided at Chudleigh and he lived throughout his time at 55 Fore Street, three doors away from the Plymouth Inn, (now Bishop Lacy). In 1891 a porter attached to the station was Alfred Boon (17) originally of Torquay. At the census date he was lodging at the nearby cottage adjacent to Chudleigh Bridge Mills. Box's replacement was John Pellow, another Cornishman who was 48 when he came to Chudleigh in the autumn of 1903. He had joined the South Devon Railway in 1875, the year before they were absorbed into the Great Western Railway. First engaged as a platform porter at Horrabridge he was soon made up to signalman. Moving to Wrangaton station as signalman he was based there for about twenty years, during which his duties took him to Hemerdon Bank and Ivybridge. He holds the distinction of being the first signalman to pass through the first train over the Ivybridge viaduct after it was rebuilt to carry a double track. A promotion to stationmaster came in 1901 and he was transferred to the Teign Valley Line where he was put in charge at Trusham. Two years later he moved the short distance to Chudleigh. He is also recorded as living in Fore Street, probably at the same house that James Box had vacated. R J Morey was one of the porters who worked with him at this period and who left on transfer to Exeter St Davids station in 1914. In 1915, aged 60 John Pellow retired from the GWR and moved to Newlands, Ivybridge where he took up as a poultry farmer. This was a continuation of a lifelong hobby through which he had become well known throughout the Westcountry as a show judge of poultry. In 1933, then aged 76 he returned with his wife to live in Chudleigh and in his later years his home was at 16 New Exeter Street. He died on 7 June 1953, the day before his 98th birthday and was buried in Chudleigh Cemetery. His wife survived him by four years. Alfred William Brooking was 36 years old when he came to Chudleigh as station master following John Pellow's retirement in 1915. He initially lived at 55 Fore Street later moving to Bay Cottage, 3 Old Exeter Street where he remained for the rest of his time in Chudleigh. He had joined the GWR in 1898 first working as a lad porter at Torquay station. From there he moved to Kingswear on promotion to parcels porter. A promotion to stationmaster in August 1913 resulted in a move to the Teign Valley Line where he was located at Longdown station. Since the station was quite remote from the village it served he actually lived at a cottage called Hillside in Fore Street, Ide. In the May of 1915 he transferred from Longdown to Chudleigh where he stayed for the next fifteen years. The two porters at this time were F Green and WC Humphries who, in 1919, both transferred out to Trusham and Barnstaple respectively. When the stationmaster post was abolished in October 1930, and as the station master post had recently become vacant at Heathfield station, he moved there until his retirement on 11 February 1939, his home there was Western Villa. On leaving, having served with GWR for a total of forty-one years a collection was raised and he was presented with a case of smoking pipes and a wallet of notes. During Brooking's time at Chudleigh the GWR Magazine reveals the names of three other porters who worked at the station. EGH Lang who transferred out to Chard in December 1920, WJ Edwards who transferred out to Exeter in June 1927 and his replacement, W Chapple, who had transferred in from Heathfield. In October 1930 the station was briefly put under the care of John George Hulme, the Trusham station master. That post was abolished in December 1932 and he moved out to Tiverton Junction. At that point both Chudleigh and Trusham stations were put under the care of the Christow stationmaster, initially Mr FJ Channing, with two porters only at Chudleigh, likely working alternate shifts. For some reason the stationmaster post was reinstated by GWR in July 1936 when Mr SJ Elson was transferred in from Athelney in Somerset. He also lived at Bay Cottage in Old Exeter Street. 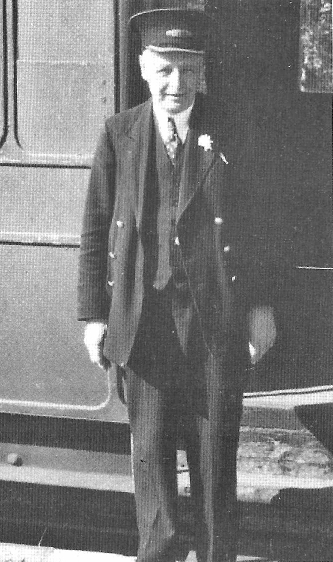 One of the porters at this time was lad porter Jim Sercombe, aged 17, in his first job with GWR. On Elson's departure to Barnstaple as chief goods clerk in May 1938, overall responsibility for the running of the station passed back to the Christow stationmaster, who by then was Mr. E J Tucker. Manning at the station then reverted back to split shifts shared between two porters. Throughout the war years staffing remained at two porters. From the GWR Magazine 'Staff Changes' section we can establish that in May 1938 JT Palmer transferred in from Stoke Canon as a Grade 1 checker porter and in November 1940 transferred out to Newton Abbot. March 1941 saw PA Harwood transferred out to Paignton to be replaced by DC Stock who moved in from Newton Abbot as Grade 1 porter. This latter porter is probably Derek Stock, who is recalled as being there during the WW2 years by ex-Bellamarsh resident Mrs Sylvia Payne (nee Hammacott). She also recalls that the Stationmaster was a Mr Ryder, from Newton Abbot who had ginger hair. After war ended and up until cessation of passenger services in 1958, staffing remained at two porters. One railwayman by the name of Hammacott is recalled as living at Bay Cottage, 2 Old Exeter Street in the mid-1950s. (Although the Sylvia Payne mentioned above has no recollection of anyone with her maiden name working at the station. She used to travel daily to Newton during WW2 to make parachutes in a factory there). Once the passenger service had been withdrawn only one man was kept on to supervise freight and parcel traffic. The general freight service was withdrawn on 14 June 1965, after which date the station was classed as a coal depot with coal and oil being unloaded there until 4 December 1967. The gentleman above is Jack Harvey, who worked on the railways for forty-five years having started out at Newton Abbot before moving to Barnstaple, then returning south to Exeter, spending many years as passenger guard on the Teign Valley line. He always wore a buttonhole and was a popular, helpful man who ' made sure those hurrying to catch the train never had the disappointment or frustration of missing it'. After retiring from the railways he became a 'lollipop man' in Exeter, working right up to the day before he died, 24 February 1962. Embarking at Chudleigh Knighton at 15:30, the train shortly crosses the Teign and to the right can be seen the substantial Bellamarsh Mill building and associated sheds, and shortly afterward the mill leat is crossed. Immediately to the right is Bellamarsh Copse, separated from the Kingsteignton road only by a low fence and boards that stop the embankment ballast slipping onto the road. This road is known locally as 'Blackboards' and is popular with raspberry pickers when they are in season. This was originally the turnpike road of 1824 leading to New Cross toll house at Kingsteignton via Bellamarsh Mill. It was designated B3193 in the 1950s and disappeared with the construction of the A38 in 1973 (though a section of the old tarmac has been re-discovered in the entrance lane to the rough field just before Bellamarsh Farm which was used to tip spoil from the A38 construction). Still looking right, the Chudleigh/Kingsteignton milestone may be glimpsed and shortly afterward the Lower Shepherds Hill Boundary Stone to show that we have passed into Chudleigh Parish. For those with keen eyes the Boundary Stone almost immediately opposite it on the left, in Stokelake Meadow, on the opposite bank of the Teign, may also be noticed. The river here, now on our left is the boundary between Chudleigh and Hennock parishes. After a gentle curve to the left the train pulls into Chudleigh Station with its single platform on our right side and the road overbridge directly in front, our journey time here being three minutes. To our left is the station garden and beyond the trees, the River Teign. Pulling away from the station after a one minute pause we pass under the road bridge, immediately noticing on the right the railwayman's allotment and just beyond that, the lower end of Oldway lane. Here too on the right is the temporary structure that is brought into use when the Teign floods which allows passengers to alight and depart as the station becomes inundated from this point back toward the station. On a low embankment we shortly pass the two recently brick-built Stokelake workers cottages on the right side (for the gardener and chauffeur of Mr Sheepshanks Esq of Stokelake House) and in no time at all cross the iron girder bridge known as Huxbear Bridge. Just before this up in the trees on the left we have passed Wood House (later named Stella), then Lyneham Farm and Huxbear Barton. The fields to the left are locally known as Barber's Marsh, after Mr Thomas Barber of Crockham Farm, Hennock. One of his fields contains the parish boundary stone erected in 1911, which unfortunately was erected on the site of a cattle rubbing stone and not the correct position according to the parish map. Over to the right we can see the end of Dark Lane and the commencement of the path through Putts Hills Wood (the end of the tunnel under the A38 today) and shortly afterward Northwood Farm. Having crossed Huxbear Bridge we pass into the parish of Hennock for one mile with the Teign keeping us close company on our right side. Curving left we notice up ahead the substantial Teign Valley Granite Company workings, set up not long after 1892 by Mr H L Hardwick. The quarry often referred to as Trusham or Crockham Quarry is actually in Hennock parish and named after the nearby farm called Crockham although that is a recent derivation of its earlier name of Crocombe. Here branching left are their dedicated sidings. Here we now cross the Crockham girder bridge and re-enter Chudleigh parish for the short run into Trusham Station. Before this is reached however, we pass over the Farley Mill Leat and the mill can be seen over to the left in Teign Lane. Arriving at Trusham Station at 15:39 we should first notice the brook that crosses at right-angles under the platform. This is the Bramble Brook and delineates the boundary between Chudleigh and Trusham and so it is that part of the station, its signal box and sidings fall within the parish of Chudleigh. Immediately to the right side of the line is Farley Lane which initially runs parallel to the track but after travelling to the south for a short way then turns away to the left up Farley Hill toward Farley Farm. A little way up on the right is Teign Lane which runs down to Farley Mill. Adjacent to the station at the other side of Farley Lane is the quarry workings belonging to Mr JH (Paddy) Dickson and opened by him in 1901. It was in the hedgerow near here that a Chudleigh Boundary Stone was noted in 1860. However this stone was never found on subsequent Beats and so it must be assumed that it was displaced when quarrying commenced in 1901 and was never replaced. Presumably the Bramble Brook along the north side of the quarry was sufficient in itself to delineate the boundary between Chudleigh and Trusham. Having stepped off the train we have about forty minutes before the 'down' train arrives to take us back to Chudleigh Station so there is time to peruse the immediate surroundings of the station. Looking up the line at the north-end of the platform is the road overbridge of stone and brick, completed shortly before the line opened in 1882. Just beyond the bridge to the right of the track may be glimpsed the stationmaster's house, erected in 1912. Almost immediately in front of the station forecourt is the Trusham lane which crosses the Teign at this point via a stone bridge, of three segmental arches designed by James Green (County Surveyor of Bridges) in 1836 and built shortly afterward by Chudleigh stonemasons John Flood and Charles Babbage. Named Crocombe Bridge after the nearby farm a bridge has existed here since at least 1583 when as a County Bridge Chudleigh parish were directed by the Justices to contribute to its repair. 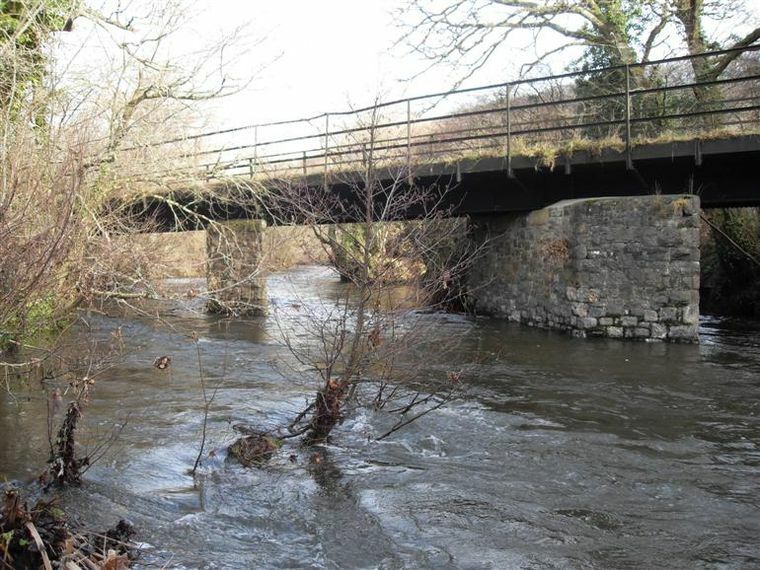 That bridge was reported as being in decay in 1677 and finally replaced in 1694 at a cost of £70. That replacement bridge, surveyed in 1809 had two arches with a roadway six and a half feet across, enough width for laden pack horses. Standing on the modern bridge looking downstream the Bramble brook is noticed on the left as it flows into the Teign. It is here that the boundary with three parishes is drawn, Chudleigh, Hennock and Trusham. Turning back to face the station building the railway sidings are located just to our left side. At 16:26 the train arrives from Exeter and after only a one minute stop it departs for its six minute journey to Chudleigh. In no time at all we are back at Chudleigh Station and having disembarked turn immediately to our left, walking along the platform we arrive at the steps alongside the overbridge that lead up to the main road. Now all that remains is the nearly fifteen minute walk back to Chudleigh town via the steep Station Hill. In 1934 the Great Western Railway started to offer camp coach holidays and in readiness for the start of the scheme nineteen coaches were converted at their Swindon works. The first season ran from May to September and continued in each summer until 1939. As a location, Chudleigh was a slow-starter, in that a camp coach was not allocated until the summer season of 1939 which in that year ran from 1 April to 28 October. The GWR offered four camp coach designations that were known as Type A, B, C and D. The coach placed at Chudleigh was a Type A variant (31ft x 8ft) which had the sleeping accommodation at each end of the coach. The coaches were painted in the GWR cream and chocolate livery and from the 1935 season also sported 'Camp Coach' titles painted in yellow. To hire the coach the rent was £3pw with a condition that the tenants purchase four monthly return fares from their home station. Railway employees could also use the scheme and stay at a reduced rate in the months of April/May and September/October. The rental included bedding, table linen, cutlery, crockery, kitchen and cleaning utensils, stove and lamps. Deck chairs were also provided. The lighting, heating and cooking was by paraffin oil which was also included. Fresh linen was provided by station staff for each let and the station staff were responsible for cleaning the coach on change-over days. It was often the practice to have the dining table laid for tea and the kettle on to boil in readiness for the arrival of the guests. WC facilities were those at the station building and to take a bath guests would need to rely on the hospitality of station staff, using their home as necessary. In the February of 1939 GWR approached the parish council with a view to having a supply of water for the holidaymakers taken from nearby Wisteria Cottage (previously called Bridge Mills Cottage). This was not agreed and with the subsequent agreement of the owner they tapped direct into the water main, running a pipe to the camp coach and having to pay the owner of the cottage a sum of 8s for the summer months water usage. GWR ended the scheme at the close of the 1939 season and was not restarted after the war. GWR were nationalised in 1948 and British Railways restarted the scheme in 1952. Various methods were used to promote the scheme; regional timetables carried full page advertisements as did the annual 'Holiday Guide' published by British Railways. Several eye-catching posters were also produced for display at stations. Perhaps the most comprehensive source of information came along two years after the commencement of the scheme in 1954. An eight page fold-out booklet was published annually which included details of hire charges, the locations offered along with a map and tariffs. Several photographs were also included. The original stock of camp coaches had in the main had been scrapped and so 'new' coaches were converted from stock dating from the 1901/02 era. For the Western Region thirty-five coaches were converted at Swindon in 1951 with a further twenty-five coaches from 1910/11 converted in 1956/57. Chudleigh once again did not have a coach allocated for the first four summer seasons but did so in the years 1956, 1957 and 1958. In the first two years the coaches had worn a red and white livery with 'Camp Coach' legend but in 1954 the coaches reappeared from the Swindon works mainly bearing a Southern Railway-style green livery with the standardised title of 'Camping Coach'. 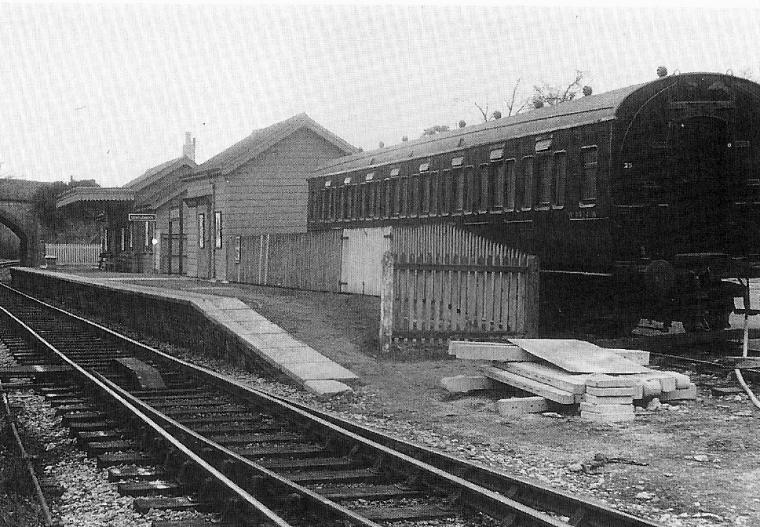 It was in this latter scheme that the coaches appeared at Chudleigh. These coaches were larger than their pre-war counterparts, the majority at 57ft long and all those used on the Western Region offered 8-berth accommodation. In line with the pre-war practice tenants were required to purchase no less than six adult return rail tickets with two children counting as one adult. Preference was usually given to parties travelling the longest distance to maximise the ticket revenue. Staff could take advantage of the camp coaches during the low and mid seasons, the rental was not discounted but staff could take advantage of their free passes/privilege fares to reach the site. 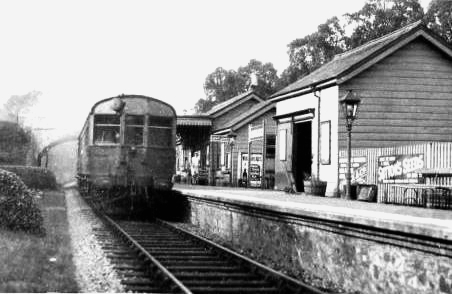 Chudleigh station was closed to passengers on 7 June 1958 but the camp coach remained on site until the end of the season in October that year.